How to SELL your STUFF! Sign up TODAY to get your seller # which can be used at any JBF in the country. Let's do this together! We're here to help you with the tools, resources and motivation needed for seller success. Join the conversation in our Consignor Facebook Group. Bring your items to the Expo Center, check in, grab a rolling rack and a copy of our Drop-off Map. Now you're set to put your items out on the floor! Checks are sent electronically within 10 days of the close of the sale. JBF Oaks Consignors earn an average of over $400 at each sale and you can TOO! An $11 fee is taken out of your check, with no upfront costs to participate. 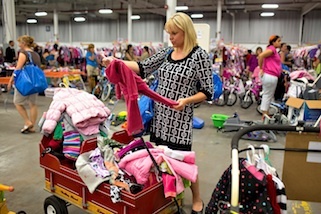 There are NO LIMITS on the # of children's clothing items or other "stuff" that you can sell! This "how to" VIDEO walk you through the process. Print Consignor "GETTING STARTED GUIDE" here! Too busy to tag? Read about our Valet Service HERE, or check out our Complete Valet Service Video HERE. (More valet details below). Helping at the sale is the #1 way to increase your earnings + you shop early not once by 2x! The #JBFPhilly Team is 600+ members strong and we want YOU to join us! Team Members who complete a total of 4 hours earn 70% AND get a cool shirt! Shop EARLY at Saturday's Half-Price Presale + you earn 2 guest passes. Shifts are available in 2, 4 or 6 hour increments. The more shifts you complete, the earlier you get to shop! The earlier you shop, the better the selection + you earn more. WIN WIN! Want to earn even more? Check out the Team Leader program. What is a Power Consignor? Click HERE to find out! Power Consignors need an appointment. Click HERE to schedule. Power Consignors do not need an appointment however, their items must be dropped off by 4pm. Now for the fun part - getting all of this stuff outta your house! 1. Prep, price and organize your stuff at home (see details below) and bring to the Expo Center ready to be SOLD! CLICK HERE for a list of items that go in our BIG TICKET AREA and need to get a YELLOW TAG from one of our Team Members. Need a Drop-off Map to help organize your items at home? Click HERE! 2. Bring your signed Consignor Agreement, Car Seat Waiver (if applicable) and one item with a barcode into the building. 3. Check in and we will provide you with a rolling rack to transport your items into the building. This VIDEO and the GUIDELINES will show you exactly how it's done! Find more stuff to sell? Bring non-clothing or shoe items to the second and third chance drop offs. You have a choice! You may donate your unsold items to our charity partner or pick up. All items will be sorted by consignor # for a fast and efficient pick up. If you are a Power Consignor (dropping off more than 300 items), and you wish to pick up your unsold items, you are required to help for 2 hours during breakdown. Pick up is super simple. Take a tour from our Lancaster sale - the process is the same in Oaks! Consignors and Team Members shop FIRST! PLEASE NOTE: You are welcome to enter any time AFTER your designated time. If there is a line, you may "jump to the front" with your pass. Due to time and space constraints, we are unable to allow children under the age of 12 before Family Shop time at 7pm. The only exception is for nursing infants who can be worn on mom or dad. No car seat carriers or strollers before 7pm, please. Children and strollers are welcome to attend the Half Price Presale and do not need a ticket. All presale passes will be distributed at Consignor Drop Off. Check THIS LIST to see what items need to get a YELLOW TICKET and/or need to be sanitized. Be selective when selling blankets, receiving blankets, burp cloths, and towels. New and barely used items sell best. Check carefully for stains. PLEASE NOTE, we DO NOT accept comforters, sleeping bags or bumper pads. Package: Larger blankets should be placed on a hanger. Receiving blankets may be placed in to Ziploc page with the tag taped to the outside of the bag. Secure the bag so that items do not get separated. Bundle blankets, cloths, and towels with ribbon or string like a package (be sure multiple pieces cannot be separated). Tag: If item is placed in a plastic bag, attach tag securely with packaging tape to the inside of the bag and tape the bag shut. If blankets are bundled with string or on a hanger, attach tag directly to blanket with a tagging gun or safety pin. Books, book sets, board games, puzzles, video games, video game systems, scrapbook, arts & crafts sets are great items for resale. In addition to children's books, we accept parenting, homeschooling, pregnancy and child rearing content. Games and puzzles MUST have all pieces. No "adult" content please or "M" video games, please. We are unable to accept VHS tapes. Check DVDs and video games for scratches and double check to ensure the disk is in the case! Package: Use clear, self-seal bags or clear cling wrap (saran wrap) to hold multiple items together; Tie sets of books together with ribbon/string. Be sure that parts/games to video game systems cannot be separated or switched out at the sale. Price: Prices can range from $.50 to $50 in this category, depending on the item. Price to sell especially for books & DVDs as there are always lots to choose from at the sale. Tag: When tagging books, please attach your tag to the book with clear tape or blue painter's tape that can be removed without damaging the item. Tape tag to the outside cover. Please do not use masking or double sided tape. Hole-punch JBF tag and tie to sets. The fall sale features fall & winter clothing only. Check out the seasonal guidelines HERE. Quality: Be picky. Look at your clothing items as if you were going to purchase them. No stained or damaged items will be accepted. Please freshly clean your clothing items. Replace missing buttons, sew loose hems and seams, and clip loose threads. Please button all buttons, snap all snaps, zip all zippers before you arrive at drop off. This will ensure that there are no defects in the clothing. The newer the item looks (and the better it smells), the more you will sell. Package & Hang: Hangers - Please hang clothes so the hanger hook points to the left (like a question mark). Hang size 0-5 clothing on child-size hangers and sizes 6-20 and maternity clothing on adult-size hangers. Refer to this guide when looking for low cost or no cost hangers! Clothing Sets: Sets tend to sell better (under size 6) so match things up if you can. All garments should be hung with the hanger hook pointing left (hanger should resemble a question mark when looking at the front of item). Safety pin or use a tagging gun to attach clothing sets securely with bottom garment hung on the backside of the shirt, so both pieces can be viewed without separating them. Pants/Shorts/Skirts - Pant-clip hangers are great but if you use a standard hanger, simply use your tagging gun to attach pants to the top part of the hanger so the garment will not slide. Onesies, socks, tights, hats and infant mittens need to be in a clear Ziploc bag (you may group multiple items in one bag). Please be sure to label your tag well so that customers know if the items are short-sleeve onesies or long-sleeve onesies. We DO NOT have a $3 rule at the JBF Oaks sale. We encourage you to price your items competitively and use this guide as a resource. Tag: Clothing on Hangers - Attach tag with a tagging gun or safety pin to the label of shirt or upper right front of pants. Insert the gun in a label or inside seam NOT through part of the clothing (to avoid making a hole or tear in the clothing). Also, pull on the tag to make sure it is properly secured and will not come off easily. Please make sure consignor tags are pulled out of the clothing so they are easily visible to the customers. Non-Hanging Clothing - Please use tagging gun or safety pins to attach tags to onesies, socks, tights, infant mittens, and accessories. Be sure to also attach multiple pieces together. Then put these items into clear zip-lock bags. Large items that need to have a Yellow Ticket attached by one of our Team Members can be found HERE. Exersaucers, swings, high chairs, changing tables, strollers, bath seats, baby walkers, car seats & car seat accessories must be checked for safety recalls, must have all parts, and be in good condition. PLEASE NOTE, we DO NOT accept cribs. Children's furniture including toddler, twin or bunk beds, desks, changing tables, dressers, etc. great sellers. Package: If item has multiple pieces use packaging tape, zip-ties, or string to keep items attached together. If wooden furniture has loose parts, use clear plastic wrap to secure item. All furniture and equipment must be assembled during the sale. Batteries must be included, if applicable. Please bring a Car Seat Waiver for any car seats, booster seats, or car seat base that you wish to sell. Nursing covers & pillows, feeding items, monitors, safety items, diapering & toileting items, rattles, and more. We are unable to accept electronic breast pumps; however, pump accessories are okay to sell. Check for safety recalls on all items that you consign. Shoes must be clean, clean, clean! We are VERY selective with shoes during Consignor Drop Off & Inspection. Shoes must be current season (Fall = September thru April; Spring = May thru August ). Package: Fasten shoes together with zip ties. For infant shoes or small shoes without laces, you may put the shoes in a clear zip-lock bag. No shoe boxes, please. Price: Shoes must be in excellent and priced right to sell. Start at $3.00 for infant/toddler; Add $1 each for larger size, name brand, or heavy/winter. Tag: Punch a hole in the top of your tag and attach the tag to the shoes with the ribbon, string, or zip tie. For infant shoes in a clear Ziploc bag, put the tag inside the bag and tape the bag shut. Ride-on toys, block sets, dolls, remote control cars, outdoor toys, learning toys, and more sell like HOT CAKES. All toys must be checked for safety recalls before selling. We accept stuffed toys that are characters (such as Mickey Mouse or Dora), battery operated (like Tickle Me Elmo) or brand new with tag. Please, no generic stuffed animals, pillow pets, Webkinz or Beanie Babies. The Perfect Consignor program is a tangible way to thank our consignors who consistently follow the JBF guidelines and bring great items to the sale. If you have three or less stained, damaged, or unacceptable items pulled at drop off or during the sale (and zero recalled items). Perfect Consignors will be given a "gold star" (aka ROCK STAR STATUS) which can be used to get in 30 minutes earlier than your assigned Wednesday presale time OR 15 minutes early for Saturday's 50% Presale. AND...Perfect Consignors are able to drop off early on Monday from 4pm-6pm!!! SWEET! REMEMBER: Perfect Consignor status is earned each sale and consecutive participation is required. Spend extra time inspecting items at home so that you earn perfect status for the next sale! New to JBF? Not sure where to start? We're here to help! There are several optional webinars leading up to the event. In less than one hour, you will know exactly how to prep, price and tag your items. Stay tuned to your email for dates and times. You can get a jump on things by watching this virtual workshop or downloading our Consignor Guide now. Need supplies? Check out our upcoming supply sales HERE. Don't have a printer or would just rather have someone else print and cut your tags for you? Watch THIS VIDEO to learn how! If you need children's hangers, cardstock or a tagging gun we've got you covered! See details to below to purchase a TAGGING KIT or TAGGING GUN. Tagging Guns are totally optional and can save you time especially if you have lots of clothing. The cost of the kit is $30 + shipping. To place your order, please click here and you will be taken to our secure PayPal account! If you would just like a TAGGING GUN with BARBS they are available for $12 + shipping. Please click here to order. We also host supply pick ups during the weeks leading up to the sale. Check out our Supply Sales Schedule HERE. HANGER INFO: Hangers can be plastic tube, department store, wire, plastic coated wire or pant clip hangers. When hanging pants, attach safety pins to the TOP part of the hanger to ensure that pant will not slide. The best hangers to use for pants are clip hangers like the ones used in department stores. TAGGING GUNS: Using a tagging gun can save you lot of time however it is completely optional. If you chose to use a tagging gun, please make sure you tag your items through the inside tag, inside lip of the neck area or the shoulder seam. The tag must fall on the outside of the shirt so it is easily seen by shoppers. This short VIDEO will walk you through how to properly tag with a tagging gun. Do you have more "stuff" than time? Valet Tagging to the rescue! Let one of our experienced taggers prep, price and transport your items to the sale...EASY! Sellers earn 45% less a $20 consignor fee. Additional fees may apply and are outlined in the waiver. Our Complete Valet Service Video explains the program. 1. Register for the upcoming sale. 2. Review and complete the on-line Valet Tagging Waiver. A tagger will be assigned when this form is received. Spots are filled on a first come, first served basis. 3. Follow the Valet Merchandise Prep Guidelines and drop off your items. 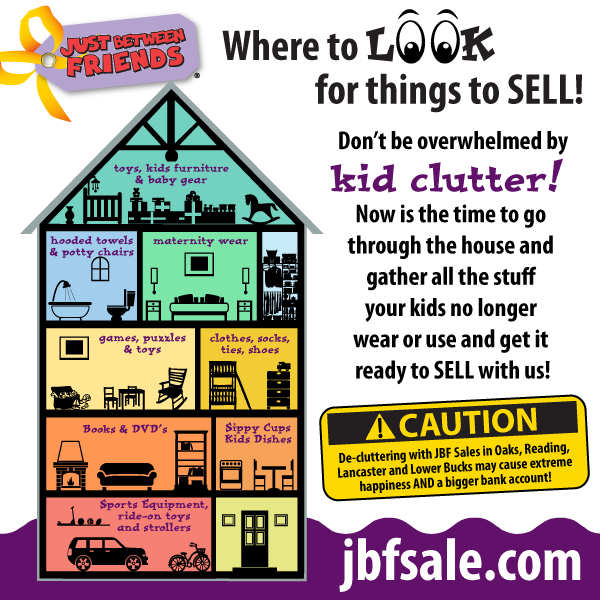 Hi, I'm Tracy and I organize the JBF sale in Oaks as well as in Reading, Lancaster and Lower Bucks (Warminster). Over the past TEN years (WOW), we have helped thousands of Philadephia area moms and dads just like you clean up and cash in with JBF. As a mom, I get it! Raising kids on a budget is tough...not to mention they grow out of things so darn fast. That's why we created Just Between Friends. Our award winning event allows local families to sell the items their kids no longer use, and get way MORE for LESS! It's a win-win and why I love JBF...I know you will too!